After starting to explain how to use each of these features, I realized I was creating a MUCH longer post than planned. This list gives you an overview: if any of these tools look helpful, check out the Manuscript Formatting Guide for screen shots and detailed instructions on how to set up and use the different features. Headings and Styles: By taking the time to use headings to mark chapter and section titles, you gain the ability to make format changes in a single place and affect the entire document. I use HEADING 1 for my chapter titles and NORMAL for most of the manuscript text. Document Map: Using headings also allows you to see your overall document structure using the DOCUMENT MAP feature. The Document Map is handy for getting a big picture of the story and for speedy navigation though a lengthy text. Table of Contents: You won’t need a table of contents in most documents, but trust me—when you do need one, it’s a pain in the booty to have to create one manually. And then the darned thing has to be updated every time to edit your document. The TABLE OF CONTENTS feature works in conjunction with document headings, creating a table of headings and the page numbers on which they can be found. Headers and Footers: On the typewriter, an author had to insert the manuscript title, author name, and page number manually at the top of every page. The “Header” allows you to add that information once and have it appear on all pages. Comments: Also found under the REVIEW tab, the Comments feature allows you to insert margin notes. It’s useful for creating notes when doing a critique, or for creating reminders of sections you want to edit, ideas you don’t want to forget, etc. Compare Documents: If you’ve ever had the unfortunate experience of making edits to an old version of your manuscript, this feature is a lifesaver. It will highlight every different between two documents, so you can go through and choose the edits you want to keep and the ones you want to trash. 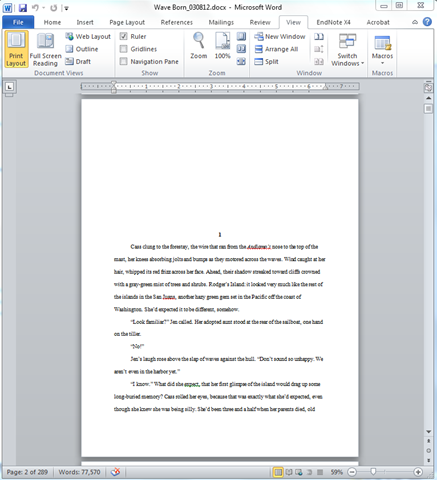 Views:Do you take advantage of the different view options in Word? I find that different views allow me to see the manuscript in different ways. Full screen lets me write and edit without distracting menus. View “side by side” allows me to move back and forth between two documents because they both appear on the screen. Side by side. Go figure. Full page: This option will show you a full document page on your screen. It’s not ideal for reading text, but it’s a great way to scan a document for blank pages, chapter lengths, and formatting errors. The REVIEW tab also offers different view options. If you’re using TRACK CHANGES or COMMENTS in the document, you can choose to have them visible or not—which can make it a lot easier to read the text. Integration with Endnote: If you’re a nonfiction writer—especially one who uses lots of references—Endnote is a great tool for keeping track of them. The real reason I’m in love with Endnote, though, is that it integrates beautifully with Word. When I need to annotate a document, I might have a hundred references and need to footnote every fact to one of them—preferably with page numbers. Imagine what it’s like to do that manually, renumbering footnotes and references every time you make a change to the document text. Now imagine that Word will update every number and reference format for you, and you’ll understand why Endnote is the nonfiction writer’s best friend. Save As…: If you ever need to share electronic versions of your manuscript, this is a good one to know. When you save, choose “Save As” to save it as a particular format. The most recent version of Word defaults to “.docx” format, which earlier versions can’t read. You may want to save as “.doc” if you’re sending it to someone with an older Word version. The “.rtf” and “.txt” formats are readable across multiple platforms; “.rtf” will retain most formatting, but “.txt” strips all formatting from the document. Document Names: Perhaps you’re already good at version control. If so, you can skip this point, especially since it isn’t really a “Word” tip. However, if you’re like me, you might get confused about which version of a manuscript you’ve sent to your critique partner. I learned a VERY simple version control technique from my fellow medical writers: I add the date to the end of my document names, so they read VOICE_032312.doc. And yes, I keep every draft. I’m paranoid that way…. I LOVE hearing from you. If you have additional tips to share, please send me a message. I’ll add them to the list! If you found this post helpful, you won’t want to miss a single issue of my monthly newsletter. Sign up now for more information about writing, marketing, and new ways to tell stories & engage readers! You’ll get immediate access to subscriber-only resources as well as monthly updates. Thanks for these great tips, Cheryl! I haven’t tried Compare Document, but it sounds really useful! I use Document Map all the time! I think you’ve covered off the key ways, Cheryl. I’ll keep coming back to this post to make sure I’m using them all more often. The only other thing I could think of to make more effective use of Word is by using ‘shortcut keys’. I tend to use them most of the time and they save you having to keep scrolling through the toolbars at the top of the document. Ah, yes, those shortcuts are worth another entire post, aren’t they? Thanks for the link! Hi Cheryl! I love reading your posts. I thought I knew almost all there was to know about Word, but it’s great hearing different opinions and leaning more! I’ve saved the document attached! 😀 Thanks! You’re so sweet :). I have to check out that Hunger Games post now…I’m intrigued. Wow. This post is SOLID GOLD. I’m going to up my WORD game. Thanks for the specifics. Bookmarking commencing. Thank you! I was worried I would overwhelm everyone with details, so it’s good to know you find it useful. Thanks so much for the comment! I’m very appreciative of you putting this post together, and for your wonderful Manuscript Formatting Guide. Wow, such helpful resources you provide here on your blog. Thank you! Awesome post, Cheryl!! I use track changes, the navigation pane, and comment reviews all the time. It’s a lifesaver! 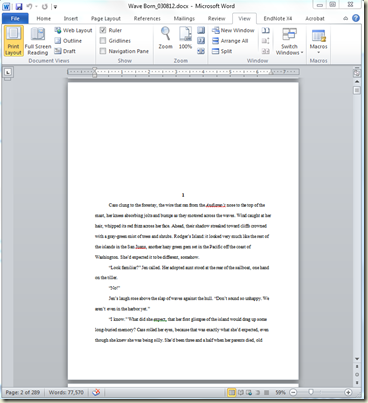 And I upgraded to the latest version of Word and found you can now save your file as a .pdf! I had to use software to convert it before. Love it! Hi Jill–oh, cool, I didn’t realize Word did that. That is, I knew it would save a file as a PDF, but I thought that was because I have the professional version of Adobe Acrobat. Thanks for the additional tip! Hee-hee, you make me smile so big my face hurts :D. Thank you! So glad it’s helpful. Cheryl, you are fabulous! #1 I love your blog site. #2 I love how you are sharing this with the writers. I think you should speak at one of the SCBWI events!!! We all struggle with MS Word. You have made it easy for us. I have just gotten a new IMAC with the new MSWord. It’s all Latin to me. I want my old MAC back. You have simplified it and I love it. YOU are a lifesaver. Thanks for your work! Thank you so much! I’m SO glad this is helpful. Yes, I’ve had my share of fights with Word, so I’m happy to share tips for defeating it :). We writers have to stick together, right? I am sharing this with my writing friends! Great post! I use Track Changes and the Comment function with my beta reading all the time. I’ve used the Compare function just for fun to see how much I’ve changed from one version to another. This is a good “pick me up” when I want to see how much I’ve improved a manuscript since the version I’d submitted receives a rejection. Hmm, maybe I’ll do a post on how I use another function I don’t see here. (I started typing it out and ended up with a huge essay after describing just the first step. LOL!) So, um, yeah, that wouldn’t work. Ha! I’ve had that happen. If you don’t do that post, though, you’re in trouble now :). I want to know what that feature is! I love the idea of comparing docs to see how much editing I’ve done. Hmm, I think that’s another post idea…writer pick-me-ups :). Happy weekend! LOL! Feel free to steal my Compare tip for your post. Happy weekend to you too! thanks for being so concise, no bells or whistles just good old fashion help! Thank you! I’m so glad you found it useful :). Ah, chapter headings. After I learned them from Google Docs, I used to use them. But due to the variety of documents I’m using to write my WIP, and the wonky chapter division that ensues, I sort of fell out of habit. I should really go back one day and add chapter headings and the table of contents. Protip: If you use the ISO date format (yyyy-mm-dd like 2012-04-19), the filenames sort properly.